Each of the five connected movements in this choral cycle contains references to 'Light,' assembled from various sacred Latin texts. 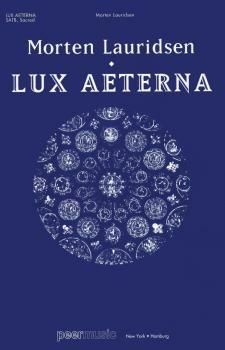 I composed Lux Aeterna in response to my mother's final illness and found great personal comfort and solace in setting to music these timeless and wondrous words about Light, a universal symbol of illumination at all levels - spiritual, artistic and intellectual. The work opens and closes with the beginning and ending of the Requiem Mass, with the central three movements drawn respectively from the Te Deum, O Nata Lux and Veni, Sancte Spiritus. The opening Introitus introduces several themes that recur later in the work and includes an extended canon on “et lux perpetua.” In Te, Domine, Speravi contains, among other musical elements, the cantus firmus “Herzliebster Jesu” (from the Nuremburg Songbook, 1677) and a lengthy inverted canon on “fiat misericordia.” O Nata Lux and Veni, Sancte Spiritus are paired songs, the former an a cappella motet at the center of the work and the latter a spirited, jubilant canticle. A quiet setting of the Agnus Dei precedes the final Lux Aeterna, which reprises the opening section of the Introitus and concludes with a joyful celebratory Alleluia.